Newly remodeled! Beautiful lake condo with breathtaking view! 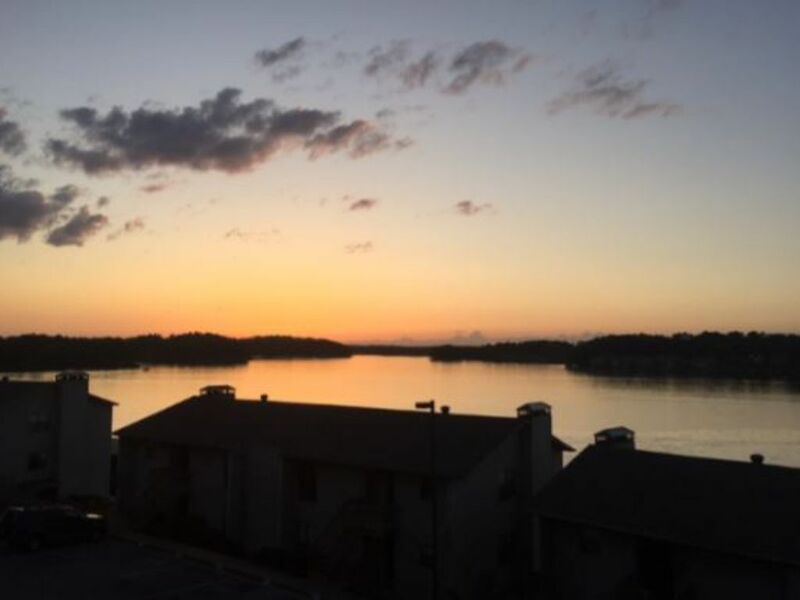 Unbelievable sunset view of Lake Hamilton with a comfortable deck to enjoy. We recently remodeled with all new furniture, two king size beds, sleeper sofa, cable tvs, and full kitchen set up. Outside the front door is a beautiful pool and tennis courts for your recreational enjoyment. Free wifi is available throughout the property for your convenience. This 2nd level condo is on gated property in a central location which provides convenience to restaurants, shopping, local attractions, and boat/water toy rentals. Also, a boat slip is available for the renters use. This is the place to relax and enjoy breathtaking sunsets. Check out our pictures of the newly redecorated condo and beautiful views of the lake. If you need additional space, we also have other condos at The Landing. The kitchen is fully stocked for all your cooking needs. It also has a coffee pot, toaster, microwave, pots and pans, and cooking utensils. Large flatscreen television in the living room. There is also a small flatscreen in the master bedroom. Could have been better. Too many problems could have been avoided. The communication with the manager was easy and her response was fast. She was very friendly and concerned about our stay. Thank you for your input. We work hard to make every guest have the BEST experience in Hot Springs. This is obvious by the large number of high ratings. I am sorry the internet had issues, we didn't have any idea and worked as quickly as possible to get the issue resolved. The technician arrived on Saturday to take care of it. We have corrected the issue with the sheets, They fit perfectly now. Also the powder on the floors is baking soda to help the carpet smell clean and fresh. I am sorry we didn't get it vacuumed before you arrived.We have been cleaning the carpet to make it smell fresh until we replace it with wood floors in the Spring. Thank you again for the input, sometimes we don't know about an issue until someone tells us. We couldn't have avoided any of these issues and worked to get them all fixed quickly. This place is seriously awesome and we shall definitely come back here. The iews are spectacular, spacious apartment. The owner made sure everything you need for the family is there in the apartment. This is our fifth time in Hot Springs, and no doubt is our best experience so far. You won’t be dissapointed at this place and in this beautiful little town. The property and pool are very well maintained the neighbors were quite and the condo was clean when we arrived. Lots of towels and cleaning supplies. The first place I’ve stayed I didn’t have to purchase dish detergent or dish washer pods. The owners have thought of everything. Clean condo with a great view in a perfect location! We thoroughly enjoyed our vacation on Lake Hamilton! The condo was very nice, with a view. The slip was accommodating of our boat. I am ready for my next trip!! !